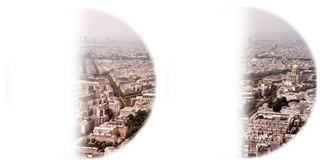 This is how someone with hemianopsia sees the world. The sight is not due to eye damage. It's due to a brain injury that literally blanks out one half of everything they look at. The complicating factor is that sometimes, the patients don't even realize that they can't see. A stroke does damage to the brain, and you can't predict what sort of damage it will do. That's part of what's so scary about it. One effect of a stroke, or occasionally another brain injury, is a strange blanking of one side of a person's visual field. The condition is called hemianopsia — a related injury, quadrantanopsia, blanks out a quarter of the visual field — and it's caused by damage to the path between the optic nerve and the visual cortex. It involves no damage to the eye, which can receive signals as well as it ever did. By themselves, neither hemianopsia nor quandrantanopsia are that bad. People are used to scanning their surroundings. It doesn't take a doctor to tell someone who sees the image above to check to their left a little more often than they usually would. What's troubling is a version of hemianopsia that includes something called "visual neglect." Patients with visual neglect don't understand that they can't see to their left. If they can't see it, they're not aware that there is something for them to see. And if they sometimes bump into things — how many of us have stubbed our toes on a door frame or banged our shins on a coffee table? That doesn't mean our brain is damaged. The main problem doctors have with visual neglect patients is the patients' own unwillingness or inability to help themselves recover from their injury. Hemianopsia used to be one of those things that either went away spontaneously after about three months or stuck around forever. There wasn't really a treatment for it. Now doctors are trying to re-train the brains of people with this type of injury. Common treatments include making a person sit in social gatherings in such a way that they have to pay attention to the neglected side of their vision, or having them play tactile games that force them to interact with what they see. Hemianopsia patients are also encouraged, when walking, to aim a flashlight at each foot as it moves, to constantly remind themselves of both sides of their world. All of these things are more willingly practiced by people who are aware they have a problem.